If, perhaps encouraged by last week’s snow, you still harbour a secret belief that global warming isn’t really happening, you can now safely abandon it. A week ago the Journal of Glaciology published a paper, “Historically unprecedented global glacier decline in the early 21st century”, compiled by the Zurich-based World Glacier Monitoring Service. For the study, WGMS scrutinised what we know about the world’s mountain glaciers, analysing about 42,000 glacier-front observations since 1600, about 5200 more detailed observations since 1850, and written and illustrated material going back to ancient times. It confirmed what glaciologists have long understood, that the world’s glaciers are retreating and getting smaller, and that the net rate of ice loss since 2000 is unprecedented, “at least for the time period observed and probably also for recorded history”. Instrument records showing rising surface temperatures are accepted among scientists but disputed by some in the wider world who claim the data are corrupted. But doubters would surely not dispute the evidence of ice vanishing from our mountains. And if you still think the main cause of this ice retreat has to be non-human, it’s way past time you abandoned that too. Decades of concerted study of natural influences has found nothing that comes close to the warming impact of human-produced greenhouse gases. Earth is warming at a potentially dangerous rate because carbon has been released from the Earth’s crust in unprecedented quantities. About three-quarters of this comes from mining and use of coal, oil and gas, and of these three, as someone once said, coal is king. In Australia, carbon dioxide emissions from burning coal for electricity are on the rise again. According to last week’s Pitt & Sherry CEDEX report, since the end of carbon pricing in June last year they’ve jumped to levels last seen in mid-2012, when the carbon price began. Coal’s impact goes way beyond carbon emissions, to devastated landscapes, coal dust, tainted groundwater and pollution from heavy metals including uranium, arsenic and mercury. The fact that we still burn coal for energy is testament to the power of old habits. A staunch defender of old habits, prime minister Tony Abbott, felt the (metaphorical) heat last week when the Federal Court, on environmental grounds, set aside his government’s approval for India’s Adani Group to develop its giant Carmichael project in Queensland’s Galilee Basin. But Adani’s own figure over the project’s life is fewer than 1500 full-time equivalent direct and indirect jobs. And India’s government has declared a preference for distributed renewables over centralised coal-power. If coal must be imported, it prefers the lower-cost Indonesian product. The PM went on to attack the court’s integrity: “If the courts can be turned into a means of sabotaging projects which are striving to meet the highest environmental standards, then we have a real problem as a nation.” This begs for more information, but none was forthcoming. The real root of Tony Abbott’s frustration isn’t the law, but business reality. Despite his best efforts to talk it up, money for coal is disappearing around the world. 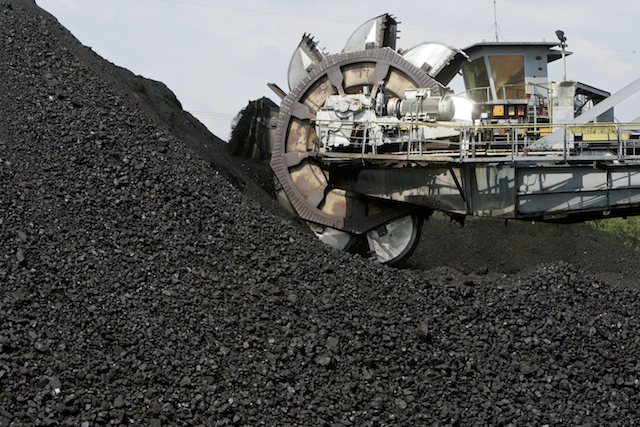 If Carmichael is to be commercial, coal must sell at close to $100 a tonne. Currently it’s at $60. Adani confirmed in June that it had halted development of the project. Then last week, after the court decision, the Commonwealth Bank announced it would withdraw as Carmichael’s financial adviser, joining a growing list of big lenders and advisers pulling out of coal projects. This argument wouldn’t be happening if big business and government took account of the huge threat that coal poses to our climate future, but in those circles it’s impolite even to raise the subject. What have we come to? AT NORTH HOBART’S State Cinema at 10.15 am on Saturday, energy minister Matthew Groom will launch the Tasmanian branch of the Australian Electric Vehicle Association. There will be a Q&A panel and electric vehicles to see, with their owners. More information, RSVP. This entry was posted in atmospheric science, Australian politics, business interests, business, investment, employment, carbon, carbon emissions and targets, carbon pricing scheme, changes to climate, climate politics, climate sensitivity, climate system, coal-fired, contrarians, divestment, economic activity, electricity networks, emissions trading, energy, fossil fuels, future climate, glaciology, ice, investment, land use, leadership, mining, modelling, natural climate influences, peak coal, planetary limits, renewable energy, science, social and personal issues, social mindsets, temperature and tagged Adani Group, Carmichael Project, CEDEX, Commonwealth Bank, Galilee Basin, Journal of Glaciology, Pitt&Sherry, Tony Abbott, World Glacier Monitoring Service. Bookmark the permalink.